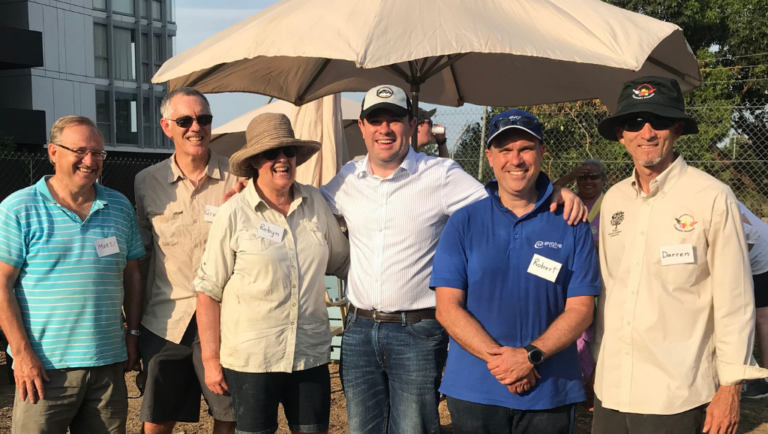 Evolve Housing’s not-for-profit real estate, Echo Realty, is proud to be involved with the newly established Thornton Community Garden, which gives locals a chance to meet their neighbours, learn gardening skills and beautify their suburb. The garden is an initiative of Thornton Community Group Inc., and will be officially launched later this year. Last week, our staff were among 40 attendees at a planting workshop held at the garden, where local member Stuart Ayres MP announced a $3000 grant to help develop the project. Echo Realty has been an active sponsor of the garden since its conception, sitting on the steering committee and providing a financial contribution. With 138 Echo Realty residents living in Harts Landing, located in Thornton, we are delighted to see the garden flourishing and providing a welcoming space for our social and affordable housing tenants. We would like to take the opportunity to thank the Thornton Community Group Inc. for their hard work in establishing the garden, and fellow sponsors AFFORD and Penrith City Council. Thanks also to Stuart Ayres MP for taking the time to visit and generously provide a grant, and the Royal Agricultural Society’s Community Greening program for running workshops at the garden. Evolve Housing is now a No Interest Loan Scheme provider!